It looks like they're closing down on mass wounding / board sweeping. That would be a reasonable assumption if they were also restricting, at the same time, some of the real sweeper that this game has (read: Plague Stone, for example). The Ravager can sweep only at one story, and only in defense. Not mentioning the fact that, as far as I know, he was never in any winning list for ages. I really don't get it, mah. Plague stone sweeps the entire board so has an inherent downside - good use of ravager just rips your oponent's board presence apart. I imagine it's just part of some fire control at FFG. There'll be a reason somewhere. Rats no longer banned - very cool! Negotium no longer restricted - very cool! Descendant no longer restricted - hmm...?!? Interstellar Migration - yeah! absolutely necessary!!! Temple of Ryleh resricted - well, ok, mekes sense. Alternativ eHistorian restricted - okay, makes sense, too. Oh no, Peter Clover and some other nice Syndicate effects can't be combined... sadly! Basically, the explanation behind every move is "it will let the metagame grow". master of myths / Alternative Historian.. what a shock! Never saw that coming. Interstellar Migration had to get hit.. or people would have a fit. So it and the FAQ about events from discard yiths are hit hard... but the deck is still very strong. Awesome to get rats and birds back!! Temple of R’lyeh is a bit of a surprise.... I never really saw this abused... like it made a good serpent deck.. but was it really that powerful? A card that is currently revealed by a card effect cannot be revealed by another card effect. for example.. what happens his effect would just fissile? Yes, it seems so. Since the effect of Prism is a passive, it would always be active when Clover tries to trigger. Since his ability references "the revealed card" and no card was revealed by his ability, it cannot resolve. Technically you can trigger it as long as you can choose a character, but it wouldn't do anything. The same thing would happen if Martin Herring were in play. Edit: I'm double-checking on this... Double-checked and confirmed by Damon. so jeremys world deck now has historian, festival, and Interstellar Migration restricted so has to lose two of those is it enough ? Without Festival and Historian, it's harder to feed the discard to get the ball rolling initially, but it still can start the response trigger train. it also has other cards that let you cheat cards into discard, non as good as historian but I know they have like a guy that you pay one and discard a card to draw he will probably replace historian and their is other cards that discard top card of both players decks, won't get in exactly what you want but can get cards into discard pile, still very strong but I guess if it takes like 6 turns to win with its balance and fair and doesnt just straight up get rid of it. [...] The same thing would happen if Martin Herring were in play. It's also worth pointing out that Hall of Champions can now fetch the Mage's Machinations for some spot character removal. Now that Descendant is unrestricted, it can essentially fetch several decent 3 cost characters. You will need a way to protect Hall, or deal with supports, but a neutral deck is becoming more and more possible. neutral deck has been viable for a while, it is just way way stronger now. Magah Birds – After 5 long years… they finally took my original suggestion!!! (not that Brad or Damon likely even knew of my suggestion but… hey, great minds am I right?) Sadly, there presence in deck lists probably won’t change a whole lot, but at least they’re an option again. As for people wondering why it’s on the restricted list… I assume it’s merely an cautionary step and to provide a potential choice between Fruit Loops and Pink Eye. Stygian wins most battles, but I rather have a choice than not. Obsessive Insomniac – Long time coming. The card is absurd, and only due to the weakness of miskatonic as a faction has it managed to get by for so many years. Temple of R’lyeh – When this card was first released… I remember emailing Damon, freaking out over how strong it was. 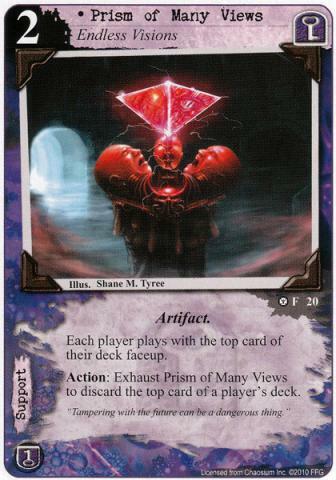 Admittedly, I over reacted a little back then, but Temple remained as a card capable of creating some serious NPE. With it and Khopesh on the list along with Por XV 14:19, Cthulhu no longer has single, obvious direction to go. Good pick for the list IMO. Master of the Myths – Regarded as the “best blocker” in the game… it probably deserves a slot on its’ merits. Add in what it did for Yithians, and you have what was probably an unregrettable choice for Brad and Damon. Alternative Historian – While I guess that most people assume she earned a slot is because she appeared in several top deck lists over the past 2 years, and while I’m certain that at least played a small part, I have a different theory. Historian was designed in the era of an ever increasingly fast metagame that was starting to spiral out of control. To counter things like… turn 2 ancient ones and other resource ramp infused strategies, miskatonic needed a way to keep up. AH was one of those answers. Now that game is being slowed down… she’s just too good. She was top tier when things were crazy, now… she’d be a bit OP no? Regardless, having to choose between her, curator and Insomniac (and even Scholar) puts some real choice back into deck building for miskatonic. Which is nice. Look at what the rest of their choices over the last few faqs did… they wound the clock back to about what the metagame was a few years ago before resource ramp, before yithians. The golden age where nearly everything was viable and cards like Ravager, who are really good at creating an NPE on their own were at the top of the food chain. My guess is, their internal testing showed this result as well. Add in that it’s near on par with Logan and was the #1 target for shock decks in terms of shear useability… Ravager earns his spot. Toss in that casual/new players who observe the B/R list can no longer put (imo) the best core combination together might help improve early experience game inbalances. Negotium - I… this is the only choice I’m not a fan of. Unrestricted negotium puts a warp on the entire deckbuilding process. The reasons it was taken off didn’t align with the reasons it was put on. So, considered me puzzled as to why, a card that creates more problems than half the cards on the restricted list, combined, is being let off. So maybe someone can explain that one to me. -	Hall of Champions fix – hooray! They remembered! With Eibon off the leash though… Halls could be a real thing… add in Negotium and… wow. Neat. -	Events Triggering from discard – Unlike the previous topic, this ruling makes gameplay more intuitive. Yes, it has some unwanted side effects, but those can be fixed later if it proves to be too much a problem. I approve. 1. Yithians – they’re vulnerable and are being forced to evolve, but they still have some teeth. Need more testing to see if they’ll still be problem though. 2. Negotium – It will bend the metagame to its’ will as it invalidates many cards and strategies. Such a shame. 3. Ancient Ones – Cthylla and Friends are still on the loose. Before they were too slow to keep up but with a better paced metagame and now negotium crushing most rush strategies, decks will likely once again be require to have a plan for the big beasties. First thoughts about the newest FAQ: I personally can't believe negotium and the descendant were taken off the restricted list! Both are stupid good and both have earned their places on the list imho. I've been playing with negotium as my restricted card of choice for the past couple years so I have quite a bit of experience with it and it def belongs on that list, but it will be interesting to see how the game reacts to it being off the list. WTF!?! Ravager got added to the list!?! Not the smartest choice in my opinion. He really wasn't a threat. A senseless restriction to me. Yithians have been toned down a notch or two but they are most certainly still playable. Master of the myths needed to be put on the list a long time ago, I knew it was only a matter of time. Overall I like the changes, but negotium and descendant should still be on the list imho and ravager should have never been added. the thing i see with negotium is if many people plan on running it then it will be useless in many matchups. i think they did enough to yithians i didn't want them to make them unplayable just not a negative experience now i think it will be another comptetive deck but you have a chance to beat atleast. I recall at least one strong combo featuring the Ravager. I don't mind it being on the restricted list: Since I still play with a restricted card pool almost exclusively, I regularly see this card and I always hate to face it! It's also the #1 problem card for new, core-set-only players. I'm also unsure about Descendant and Negotium. The former is still my default choice when my deck isn't built around one of the other restricted cards. Negotium, I still haven't used _ever_, but I've faced it and dislike its effect on games (probably because I have a weak sport for rush decks...). I agree with all other choices, although it saddens me to see Miskatonic being hit with the nerf-bat after it had its short spot in the limelight.